Return to the world of automotive pioneer Henry Ford at the Henry Ford Estate ~ Fair Lane in Dearborn, Michigan. An architectural mix of Modern Prairie style and Mid West Castle. As newlyweds, Clara and Henry first lived in a farmhouse on property owned by Henry’s father. But Henry’s passion for mechanics led him away from the farming life. Clara, who literally stood by his side as he poured gasoline into his experimental engine, embraced his calling and believed in his future success. In 1891, they moved to Detroit where they resided in a series of apartments and houses as Henry lead two unsuccessful attempts at starting an automobile company before realizing success in 1903 with Ford Motor Company. The immediate popularity of the Model T, introduced in 1908, secured both wealth and renown for the Fords who sought a home away from inquisitive reporters and gawking fans. They began construction of their beloved home, Fair Lane, in 1913. True to their roots, Clara and Henry seemed most comfortable in the rural countryside of their youth. They named their home, Fair Lane, after the birthplace of Henry’s grandfather, Patrick Ahern, in County Cork, Ireland. Fair Lane, built on 1300 acres of farmland, was just miles from both Clara’s and Henry’s places of birth. Most of the estate’s structures stand today -- the main residence, the powerhouse and garage, the greenhouse and gardening building, the boathouse, and the stables. Frank Lloyd Wright was retained to design the house; but shortly after beginning, abandoned his practice. Taking on Wright’s commissions, Hermann V. von Holst and James L. Fyfe engaged Marion Mahony Griffin, an associate in Wright’s studio, to design Fair Lane. She utilized the “Prairie School” philosophy for its design, but at odds with elements of the design and expense, as well as enamored of English manor houses after their first trip to Europe, the Fords dismissed the architects and engaged William H. Van Tine. 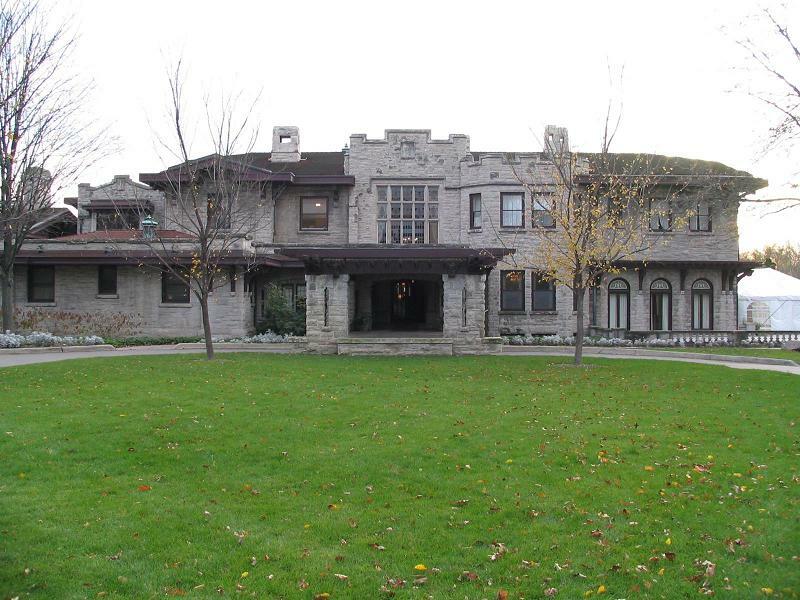 He greatly modified the design into the eclectic mix of English castle and Midwestern prairie-style that survives today. The extensive gardens for the estate were designed by the landscape architect Jens Jensen.